Large-scale events leave an unquestionable mark on social media. This was true of Hurricane Sandy, for example, and is also true of the widespread protests in Egypt this week. On Wednesday, the Egyptian Military responded to the large-scale demonstrations against President Morsi by removing him from power. Can Twitter provide early warning signals of growing political tension in Egypt and elsewhere? My QCRI colleagues Ingmar Weber & Kiran Garimella and Al-Jazeera colleague Alaa Batayneh have been closely monitoring (PDF) these upheavals via Twitter since January 2013. Specifically, they developed a Political Polarization Index that provides early warning signals for increased social tensions and violence. I will keep updating this post with new data, analysis and graphs over the next 24 hours. The QCRI team analyzed some 17 million Egyptian tweets posted by two types of Twitter users—Secularists and Islamists. These user lists were largely drawn from this previous research and only include users that provide geographical information in their Twitter profiles. For each of these 7,000+ “seed users”, QCRI researchers downloaded their most recent 3,200 tweets along with a set of 200 users who retweet their posts. Note that both figures are limits imposed by the Twitter API. Ingmar, Kiran and Alaa have also analyzed users with no location information, corresponding to 65 million tweets and 20,000+ unique users. Below are word clouds of terms used in Twitter profiles created by Islamists (left) and secularists (right). 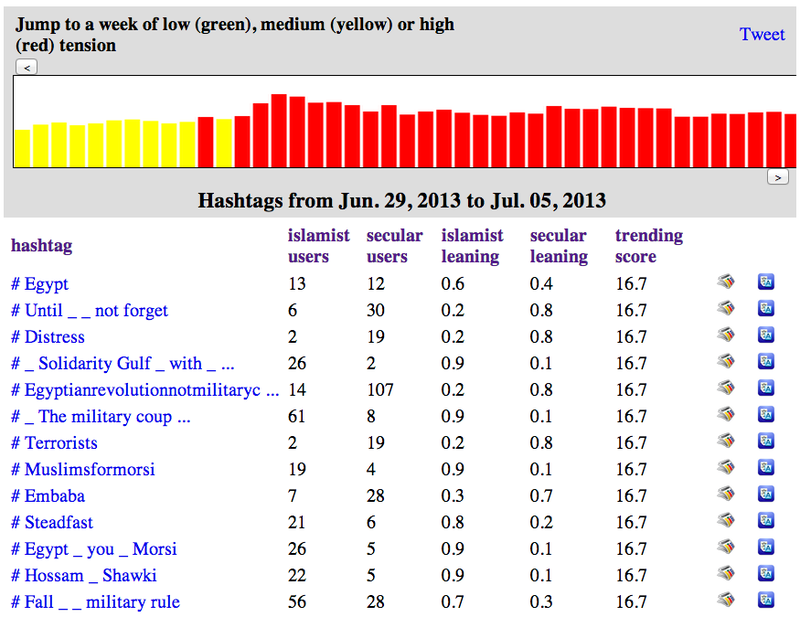 QCRI compared the hashtags used by Egyptian Islamists and secularists over a year to create an insightful Political Polarization Index. The methodology used to create this index is described in more detail in this post’s epilogue. The graph below displays the overall hashtag polarity over time along with the number of distinct hashtags used per time interval. As you’ll note, the graph includes the very latest data published today. Click on the graph to enlarge. A – Assailants with rocks and firebombs gather outside Ministry of Defense to call for an end to military rule. B – Demonstrations break out after President Morsi grants himself increased power to protect the nation. Clashes take place between protestors and Muslim Brotherhood supporters. C, D – Continuing protests after the November 22nd declaration. E – Demonstrations in Tahrir square, Port Said and all across the country. F,G – Demonstrations in Tahrir square. H,I – Massive demonstrations in Tahrir and removal of President Morsi. In sum, the graph confirms that the political polarization hashtag can serve as a barometer for social tensions and perhaps even early warnings of violence. “Quite strikingly, all outbreaks of violence happened during periods where the hashtag polarity was comparatively high.” This also true for the events of the past week, as evidenced by QCRI’s political polarization dashboard below. Click on the figure to enlarge. Note that I used Chrome’s translate feature to convert hashtags from Arabic to English. The original screenshot in Arabic is available here (PNG). Each bar above corresponds to a week of Twitter data analysis. When bars were initially green and yellow during the beginnings of Morsi’s Presidency (scroll left on the dashboard for the earlier dates). The change to red (heightened political polarization) coincides with increased tensions around the constitutional crisis in late November, early December. See this timeline for more information. The “Tending Score” in the table above combines volume with recency. A high trending score means the hashtag is more relevant to the current week. The two graphs below display political polarization over time. The first starts from January 1, 2013 while the second from June 1, 2013. Interestingly, February 14th sees a dramatic drop in polarization. We’re not sure if this is a bug in the analysis or whether a significant event (Valentine’s?) can explain this very low level of political polarization on February 14th. We see another major drop on May 10th. Any Egypt experts know why that might be? The political polarization graph below reveals a steady increase from June 1st through to last week’s massive protests and removal of President Morsi. Acknowledgements: Many thanks to Ingmar and Kiran for their valuable input and feedback in the drafting of this blog post. Methods: (written by Ingmar): The political polarization index was computed as follows. The analysis starts by identifying a set of Twitter users who are likely to support either Islamists or secularists in Egypt. This is done by monitoring retweets posted by a set of seed users. For example, users who frequently retweet Muhammad Morsi and never retweeting El Baradei would be considered Islamist supporters. (This same approach was used by Michael Conover and colleagues to study US politics). Once politically engaged and polarized users are identified, their use of hashtags is monitored over time. A “neutral” hashtags such as #fb or #ff is typically used by both camps in Egypt in roughly equal proportions and would hence be assigned a 50-50 Islamist-secular leaning. But certain hashtags reveal much more pronounced polarization. 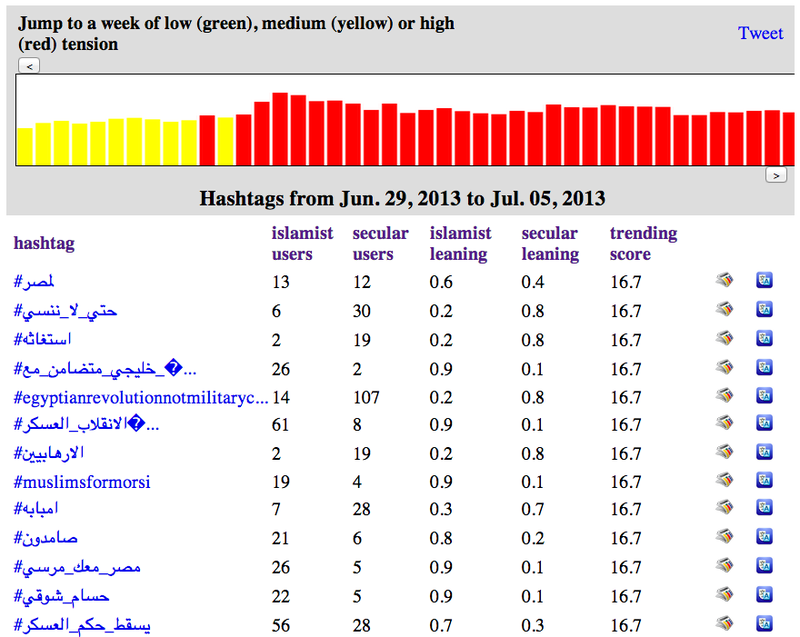 For example, the hashtag #tamarrod is assigned a 0-100 Islamist-secular score. Tamarrod refers to the “Rebel” movement, the leading grassroots movement behind the protests that led to Morsi’s ousting. Similarly the hashtag #muslimsformorsi is assigned a 90-10 Islamist-secular score, which makes sense as it is clearly in support of Morsi. This kind of numerical analysis is done on a weekly basis. Hashtags with a 50-50 score in a given week have zero “tension” whereas hashtags with either 100-0 or 0-100 have maximal tension. 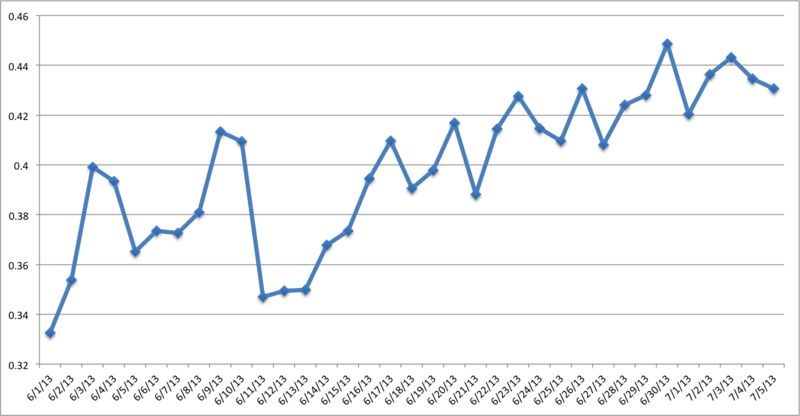 The average tension value across all hashtags used in a given week is then plotted over time. Interestingly, this value, derived from hashtag usage in a language-agnostic manner, seems to coincide with outbreaks of violence on the ground as shown in bar chart above. This entry was posted in Big Data, Crowdsourcing, Social Computing, Social Media and tagged Egypt, Islamists, Polarization, Political, Secularists, social, Tensions, Twitter. Bookmark the permalink. Fascinating. But reading the methods, I don’t think the index actually measures “polarization,” but rather, expressions of polarized political sentiment. The underlying “polarization” might be relatively constant while the amount of expression varies. This points to the question of how we conceive of polarization: is it what people did last week, or is it the deeper structure of social ties? I feel the latter because, for example, if I were to make a claim of decreased polarization I’d want to see more integration of the social networks of the two sides. Can we develop a polarization index based on social network structure? Valid point Jonathan. 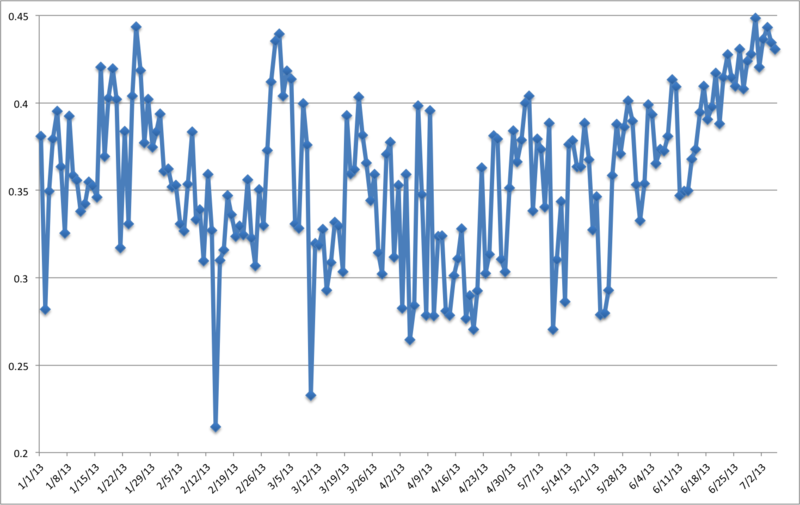 We just observed that our index – whatever it measures – correlates with things “on the ground”. We could definitely look at changes in the network structure, combined with community detection algorithms. If the connections between the two communities then get sparser then that’s a bad sign. We chose to focus on the content and the “expressions” as we believe that this operates at a faster time scale. We expect/guess that the network topology would change more slowly and that, e.g., follower links take some time to be (un-)made. And, of course, content is easier to handle than changes in network topology. Will be happy to discuss more if you like. Excellent. Measuring narratives will definitely be a major key to understanding levels of discord. Q. 14th of Feb is also the anniversary date of Bahrain uprising .. perhaps the drop is just indicative of a simple shift in focus? Thanks for reading & chiming in, Stephanie. Interesting suggestion re Bahrain, will ping Ingmar et al about that. Any other findings from your Mali analysis?